Imagine working in an organization where the aim of your colleagues is to help you achieve your results. I could not believe it possible. After reading this book I just had to bring Arbinger to the UK to teach our people. What an experience! We are all better people for it. This book touches the very foundation of culture, teamwork, and performance. After decades of executive leadership in senior management positions, I’ve finally found in Arbinger what I consider to be the best means of improving every measure of success. From boosting the bottom line to increasing personal joy, this book shows the way. Rarely has a book had such an immediate and profound impact on the hundreds of CEOs of fast growth firms we work with through our MIT/Inc./EO Executive Program. And it’s one of those rare books that touches both the personal as well as professional lives of these leaders. This is probably the most outstanding book that directs us to soul searching and introspection. It teaches us to take accountability for our lives and our destinies in a down-to-earth and bluntly practical manner. The lessons in this book have helped me personally, as well as other people I love. The leadership principles in this book have had a greater impact on the quality of leadership in our company than anything we have ever implemented. They have been extraordinarily important in helping make our company a great place to work while at the same time helping us focus on results and increase productivity as never before. Remarkable. Arbinger possesses the hidden key to productivity and creativity. Do whatever you can to get your hands on this material. This book was recommended to me at an annual strategic planning session. I was stunned by the truth of it and the simple solution. Our entire management has now read it. It has been a building block for our personal and organizational development. My business partners and I built a health-care company on the ideas in this book. We are amazed at what it has helped us achieve. Careful reading and rereading of this book has proven better than any productivity, team-building, or leadership training we’ve encountered. It's one of the better books that talks about EQ in the workplace and gets to the core challenges people have working with one another, especially at growing companies. Some leaders are right. They are always right. And when they are not right, see the first two statements and apply them accordingly. This is the path towards destruction for any company – when leaders lull themselves into believing that they are invincible and incapable of making mistakes. They develop a toxic culture around them, where employees know that the surefire way to a promotion is stroking the leader’s ego. In this book, you will find painful examples of what happens when such a business culture is allowed to grow. Don’t be that kind of leader – learn to be your number one critic. 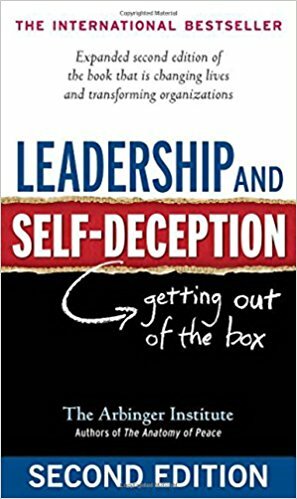 Since its original publication in 2000, Leadership and Self-Deception has become a word-of-mouth phenomenon. Its sales continue to increase year after year, and the book's popularity has gone global, with editions now available in over twenty languages.